Last post I determined the pattern and fabric that I would be using for the baby dress I am making as a gift for a friend. In this post, we look at the embroidery. The pattern called for Lazy Daisies, but I opted for bullion daisies instead. 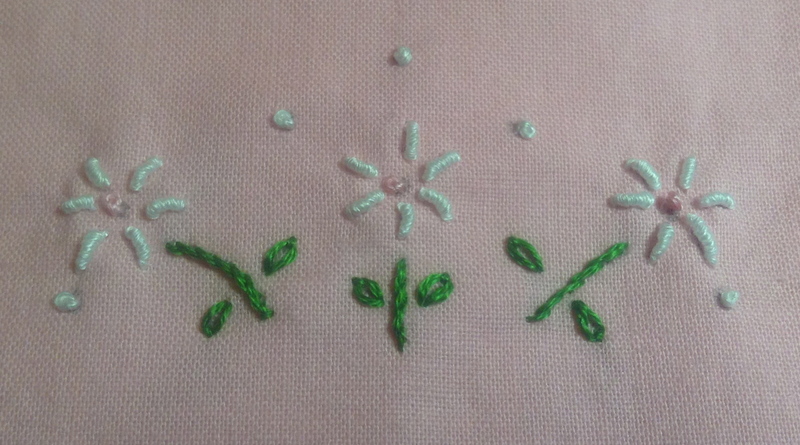 Really, any flower could be used here, but I just like making bullion knots, so this was my personal preference. If you have never done this type of knot, here is a tutorial from one of my favorite needlepoint and embroidery sites. 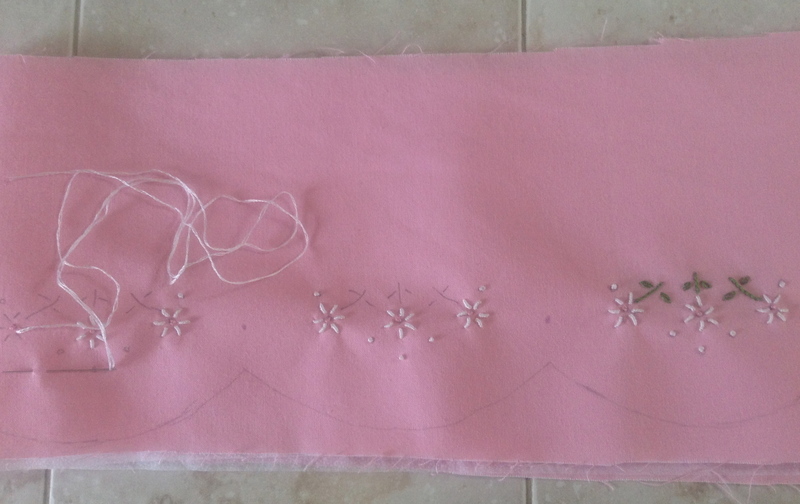 As you can see, I have not cut the piece out, but rather drawn the outline of the pattern piece on the fabric. The reason for this will be clear in the next post. Close up of the embroidery unit. After completing the embroidery, I read and re-read the pattern for assembly. I could still be wrong, but at this point, I have decided that this pattern (Simplicity #2392) has an error in it. The pattern tells you to cut 2 of the hem band. This is what I did. One piece for the facing and one piece for the actual band that I then embroidered. From what I can tell, the pattern actually needs two bands and two facings in order to accommodate the entire hem. So, I cut another band and embroidered it as well. If, somehow, I don’t need it later on, I will just use it for another dress, or something. Finally, here is a quirky thing that I do while watching period dramas (my favorite type of movie, tv, etc.). When I see a costume or a part of a costume that I like, or would like to recreate, I pause the film and take a photo with my phone of the screen. 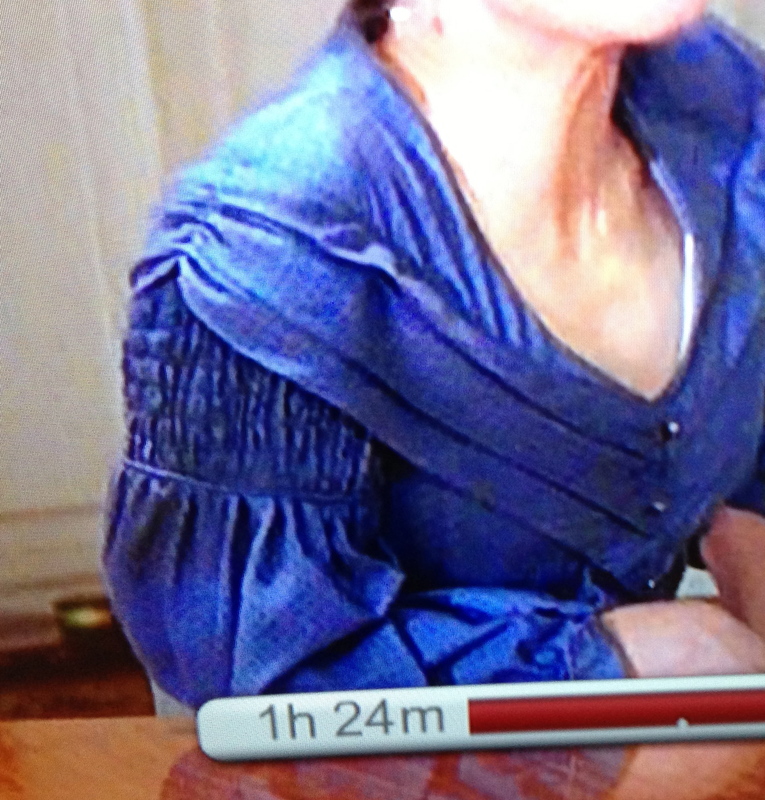 This dress (above) is from the movie Impromptu and I really love the smocking detail on the sleeves. Cool, huh? Am I the only one who does this? Lovely! I really like the period dress. I did copy (online) a still frame in a preview on a movie once for a knitted shawl that I really liked. I could stop it when I wanted and capture the pic. Got several views of the item that way.